This curry salmon noodle bowl with mango is packed with fresh flavors! 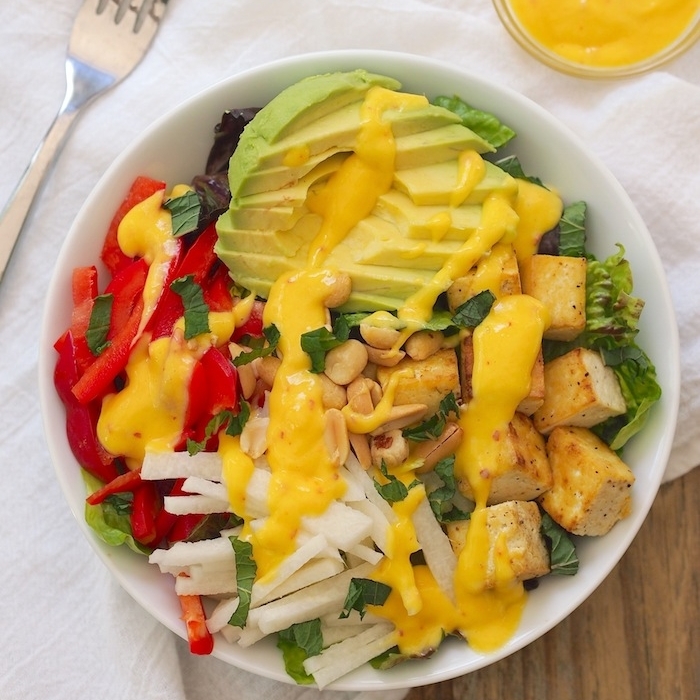 Drizzle with a soy-lime dressing for even more of a kick! With intuitive eating, you're never done learning. I consider myself a fairly intuitive eater at this point, but I still have learning moments! Like last Thursday, for example. It was a really crazy day with leading a lunch and learn at Colonial Life, a client session, our last meeting before launching Joyful Eating and an evening meeting for our Columbia dietetics association, where I'm serving as the education chair for the second year. Running around all day, I wasn't really hungry and ended up eating a late, light lunch. Going into my five pm meeting, I felt comfortable, probably a five on the hunger/fullness scale. I figured I'd be ready to whip up dinner as soon as I got home, but as the meeting ran late, my stomach started to growl, my head started to throb - I was famished. After the meeting was over, I was way too hungry and tired to cook and decided to meet my husband and friends at our local soccer bar where they were planning to watch the Copa America game. I glanced over the menu, and even though I knew Thursday was curry night and they make seriously one of the best curries I've had, my famished stomach was yelling "YOU NEED THE BURGER WITH BACON AND FRIED EGG AND CHEESE AND AAAAAALLLL THE FRIES." Three bites in and I had regrets. What my body was really craving was to feel energized after a long day and for fresh flavors with lots of spices. Not a greasy burger, which was already making my stomach hurt. Years ago, I would have beaten myself up for it. Blamed willpower. Told myself I was a poor excuse for a dietitian. But instead, I filed the experience into my mental bank where it'll serve as a reminder to be prepared with snacks and reheat and eat meals on full days and that when I'm really physically hungry, any food will fill the empty hole in my stomach. And then I stared longingly with sad puppy dog eyes when my friend was served his delicious looking chicken and vegetable curry, being the mature adult that I am. This curry salmon noodle bowl is super filling, energizing and packed with the same fresh flavors I was craving that night. If only I had the ingredients on hand that day to whip this up real fast! Ever since our trip to Vietnam, I've been obsessed with noodle salads. I usually use rice noodles or cellophane noodles, which are very thin and have a nice chewy texture. Plus, they soak up all the delicious flavor from the dressing. Also, feel free to use different vegetables or protein if you like. Chicken, pork or baked tofu would go great here, and for vegetables, radish, peppers, snap peas and sprouts would all add a similar fresh crunch. First make dressing. Whisk together sugar and warm water until dissolved. Whisk in jalapeno, sesame oil, soy sauce and lime juice. Set aside until ready to use. Heat oven to 250 degrees. Pat salmon filet dry with a paper towel, place on a baking sheet and spray lightly with olive oil. Sprinkle with curry powder and season with salt and black pepper. Place in the oven and roast until it flakes easily with a fork, about 20 minutes. Remove from oven and let cool slightly. Meanwhile, bring a large pot of water to a boil and cook noodles according to package instructions. Drain and rinse with cold water. Use scissors or shears to cut a few times into smaller strands. Divide butter lettuce between four bowls. Break salmon into pieces. Divide carrot, cucumber, mango, avocado, scallion and cilantro between the four bowls. Sprinkle with cashews. Drizzle with dressing and serve.